Undoubtedly the best known off all Soviet aircraft and built in larger numbers than any other warplane since the end of World War II, the MiG-21 was one of the most important warplane types fielded by the USSR together with its allies and clients in the 1960s and 1970s, and is still a valuable element in the inventory of many smaller air forces, whose continued adherence to the type is indicated by the number of update schemes developed by Western aircraft and avionics companies in the period after the collapse of the USSR. Schemed as a fast-climbing day interceptor, the MiG-21 indicates to extent to which conceptually different approaches can be used for the same basic end, for it was radically different from the two most important Western types planned for the same task, namely the Dassault Mirage III and Lockheed F-104 Starfighter, and indeed was considerably more successful than either of the Western interceptors in numerical terms. 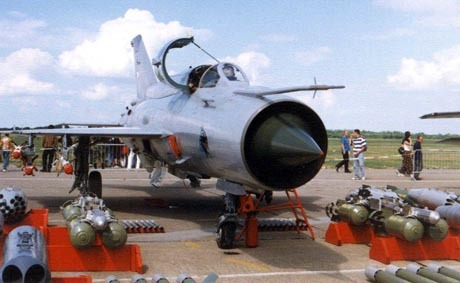 This should not be allowed to disguise the fact, however, that the MiG-21 was in its first versions woefully deficient in endurance, sensor capability and, to a slightly lesser extent, firepower. In the aftermath of the Korean War (1950-1953), the Soviets undertook a careful analysis of the performance of their warplanes in that conflict, and in March or April 1954 issued a requirement for a day interceptor in which virtually every other factor was subordinated to the need for outright flight performance. This was exactly the rationale that led �Kelly� Johnson to develop the F-104 as a heavily loaded �manned missile� with a powerful turbojet and small but straight flying surfaces, while the Soviets finally opted for an altogether different approach reflected in a lightly loaded aerodynamic platform with a comparatively low-powered turbojet and large but swept flying surfaces. The aerodynamic configuration for the new type was investigated with the aid of the TsAGI (Central Aerodynamic and Hydrodynamic Institute), which recommended a tailed configuration based on a conventional wing swept at between 57 and 60 degrees or a delta wing swept at between 50 and 55 degrees. Armed with these TsAGI recommendations, the competing Mikoyan-Gurevich and Sukhoi design bureaux each developed perhaps a dozen differing prototypes of varying configurations and sizes with higher- and lower-powered turbojet powerplants. These were intended to validate a number of design concepts, and all the MiG types were powered by a single engine. The most important of these was the Ye-50 of 1955, which had a swept wing based on that of the MiG-19 fighter and reached a maximum speed of 2460 km/h or Mach 2.32 with a hybrid powerplant comprising one RD-9Ye turbojet rated et 37.26 kN with afterburning and one S-155 rocket motor at the base of the vertical tail surface. The Ye-50 provided much useful data for the following �clean paper� designs. These were the Ye-4 and related Ye-5 with a delta wing, and the Ye-2 with a conventional swept wing. Each of these was probably powered by the RD-9Ye engine pending the availability of the definitive MNPK �Soyuz� (Tumanskii) R-11 turbojet.The first of these MiG-21 precursors to fly was the Ye-4, which took to the air for its initial flight in December 1955. The R-11 engine became available in the spring of 1956 for the two definitive prototypes, which were the Ye-2A and Ye-5 that first flew in May and June 1956 respectively. These prototypes took part in the great 1956 fly-by at the Aviation Day Display at Tushino near Moscow, and received the NATO reporting names �Faceplate� and �Fishbed� respectively. The two aircraft were exhaustively tested, and neither revealed a clear advantage over the other. In December 1956, the delta-winged Ye-5 was finally selected as the basis for a production model as it had slightly greater fuel capacity as well as greater growth potential, and there followed the Ye-6 pre-production prototype used for development of the powerplant and flight-control system. The type was at last cleared for production during 1958 as the MiG-21, which received the NATO reporting name �Fishbed-B�. This was really a pilot production model armed with two 30 mm Nudel�man-Rikhter NR-30 cannon and powered by the R-11 turbojet rated at 38.25 kN dry and 50.01 kN with afterburning, and supplied with fuel from an internal capacity of 2340 liters.